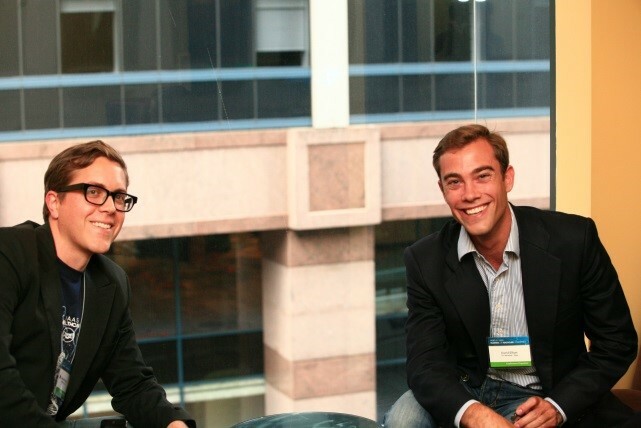 Berkeley MBA Students Blog | Full-time students share their experiences in the Berkeley-Haas MBA program. 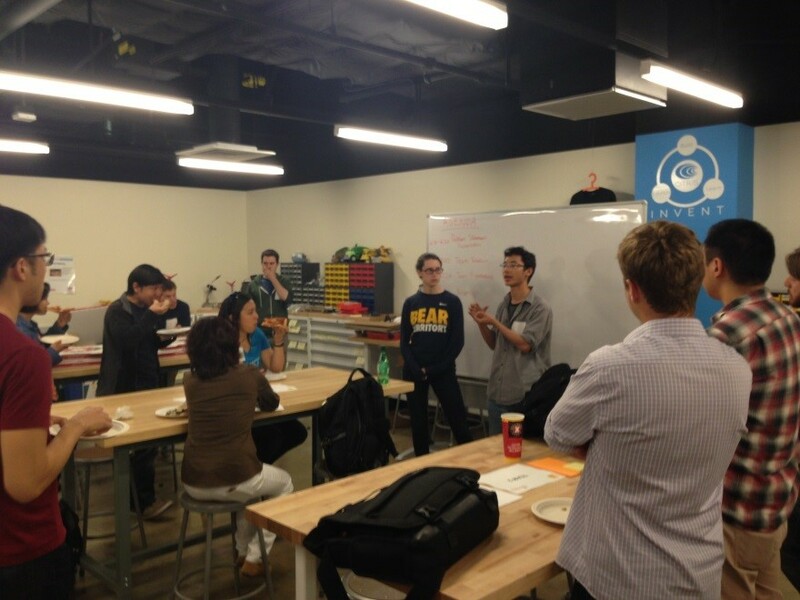 At Haas, we often discuss taking advantage of the Berkeley community and collaborating with other graduate programs. 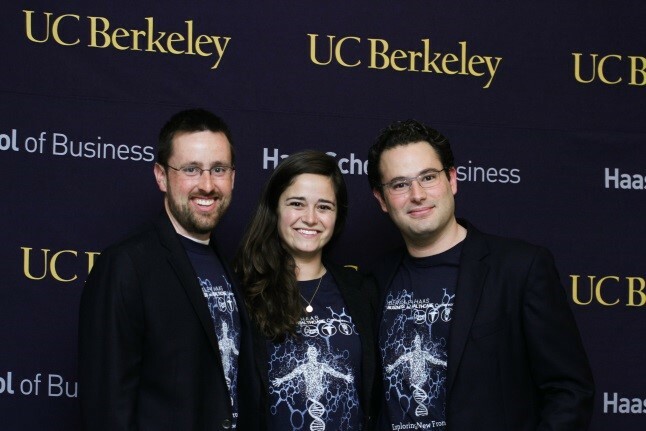 This spring, Haas Technology Club (HTC) and the Foundry @ CITRIS, a Berkeley start-up incubator, decided to work together and kick-off the Berkeley Solver Series. The idea was to create a monthly event consisting of Haas MBAs and Foundry team members to increase collaboration between the two groups. A Foundry team would present a current challenge facing their start-up, and we would divide into teams comprised of members of both programs to brainstorm potential solutions. 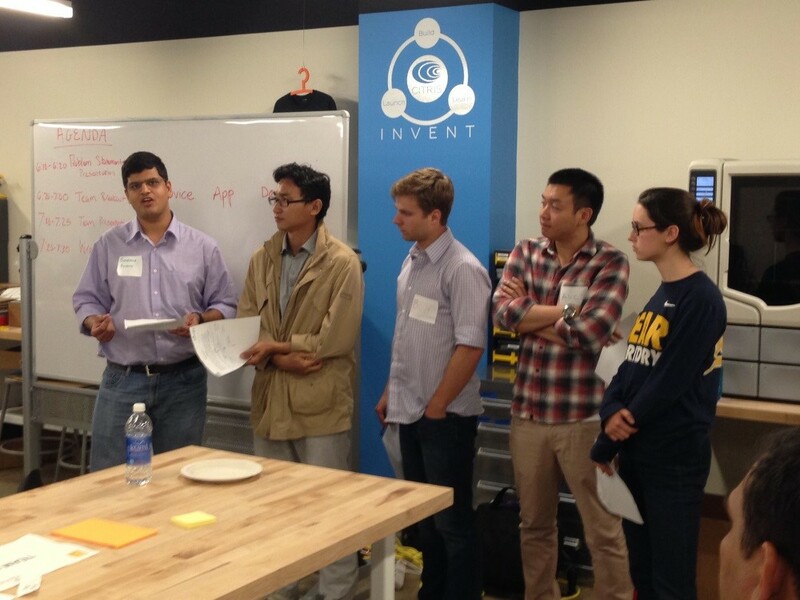 At the end of the event, the teams would present their solutions to the whole group. We kicked off our first session on April 15th at the Foundry’s Invention Studio on Berkeley’s campus, with 12 MBAs and 10 Foundry team members. The presenting team was Clairity, a start-up developing a personal air quality sensing device that wirelessly communicates with users’ smart devices. The app will use crowdsourced data from the portable sensors to generate real-time pollution maps of cities, allowing users to search for public venues or navigation routes with low exposure. Clairity asked the group to help them develop a business plan and monetization strategy for their product. After Clairity presented their challenge, we broke out into five teams and brainstormed solutions for 45 minutes. Each team then had 5 minutes to present their high-level solutions, followed by Q&A. 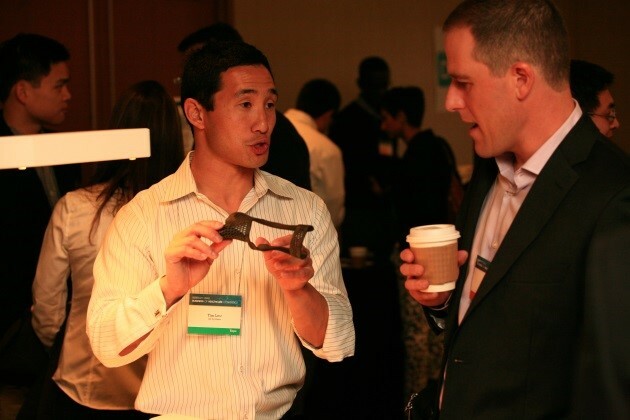 The event was a success, providing the start-up with a number of ideas to bring their product to market. 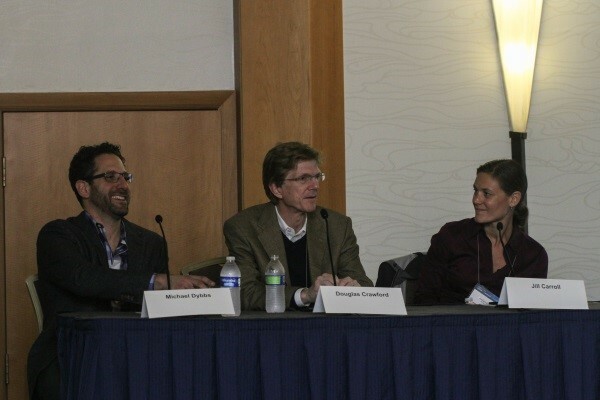 All participating members also received access to Foundry speakers at an upcoming VC panel. We look forward to building upon the first event and continuing the series in the fall! Last Friday I rose at 6 a.m. feeling giddy. Instead of heading to campus, I left my house in North Berkeley for the BART station and San Francisco. Just underground and through a turnstile, I ran into Dan, one of my amazing MBA/MPH classmates. We took the 25-minute BART ride together from Berkeley to Union Square to meet the rest of our team ahead of the Haas Business of Healthcare Conference. More than 40 students in the Haas Healthcare Association, our health hub at Berkeley-Haas, had been working together since fall to create this 8th annual daylong event. Once at our conference site at Hotel Nikko, I checked in with our volunteer coordinator, Zoe, saw our conference leaders Chris, Manuel and Mary Claire, and ran into more of my MBA and MBA/MPH classmates as the first, then second wave of our 300+ attendees arrived. Minutes later the conference was in full swing with speakers, professionals, alumni, and entrepreneurs from VC, consulting, global health, health tech, biotech, pharma, devices, providers and services, and other fields. 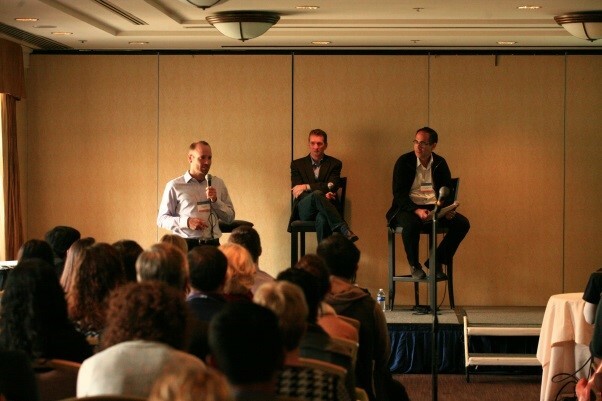 Throughout the day, thought leaders in health took the main stage. We heard from incredible leaders like Dr. Robert Pearl, CEO of the Permanente Medical Group, Matthew Douglass, co-founder at Practice Fusion, and Amir Dan Rubin, president and CEO of Stanford Hospital & Clinics. 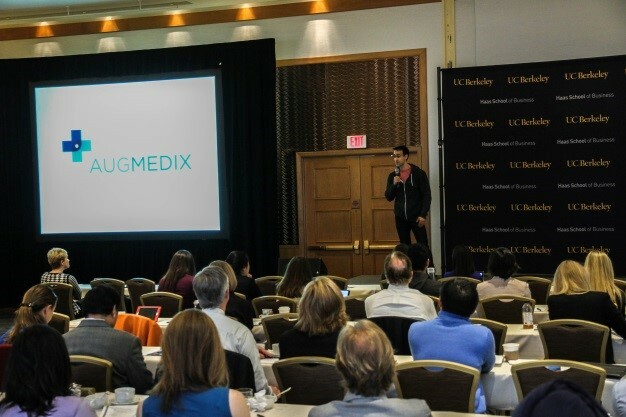 For the first time at our conference, nearly 20 entrepreneurs pitched their products in a back-to-back speed round and later met attendees at a high-energy health tech expo. An attendee turned to my co-president after the pitches and said he had never seen start-ups featured this way and how much he enjoyed it. We took this as a sign that we continue to challenge the status quo whenever we have the chance! Start-up health companies who joined us for the day included Augmedix, Lift Labs, Proteus Digital Health, ThriveOn and many others. 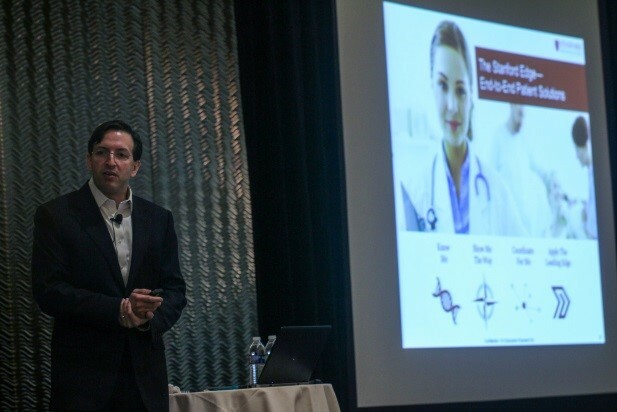 Six breakout sessions helped grow excitement and momentum around targeted areas of health. Groups of attendees joined together to discuss Obamacare’s winners and losers, reverse innovation and global health, changing the culture of care delivery, funding life sciences, and big data. With a team of three 1st and 2nd year MBA students, I organized a session about transforming wellness and prevention through technology. It was exciting to look out to see a packed room and to bring great speakers and perspectives to my classmates and our attendees. The conference ended but we stayed another hour longer to connect with speakers, alumni, professionals, and each other at a reception at Hotel Nikko. My classmates did a fantastic job working together to organize every aspect of the conference start to finish. As I rode home with three classmates over the Bay Bridge, I realized I had learned just as much from all of them as I did from our esteemed speakers. The experience left me inspired to stay curious and keep following my own journey and reminded me why I decided to join this incredible program and community. It was a great day to be a Haasie! I came to Haas with a background in environmental nonprofit work, a passion for food, and a desire to find a role where I could have a strong impact in improving the food system. Now, in the second half of my first year, I am Co-President of the Culinary Club and VP of Sustainable Agriculture and Food for the Net Impact Club. These leadership positions give me a strong platform to interact with companies and give myself and other students an inside view on what is happening locally in the food industry. A few weeks ago, I organized a trek for eight Haas students to spend an afternoon with the founders and staff of AgLocal, a tech startup that connects sustainable meat producers with chefs and restaurants. 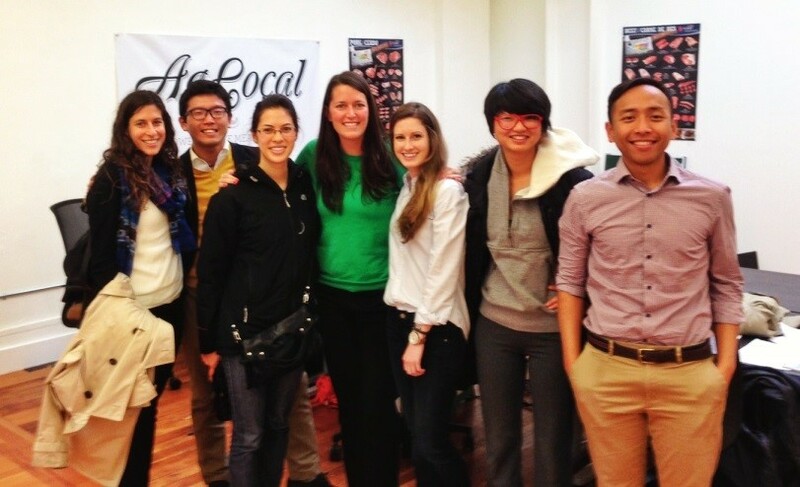 AgLocal is a great representation of what the Bay Area has to offer – cutting-edge technology, an entrepreneurial culture, a love of food, and a strong commitment to responsible business. On our trek to AgLocal, the founder, Naithan Jones, walked us through how and why he started the company. His team shared the opportunities and challenges they have faced since launching and candidly shared stories of the mistakes they’ve made. They asked for our input and engaged us in a meaningful discussion about a pivot they’re making as a company. We were also able to see the co-working space they share with other startups, giving us more of a sense of what it’s like to work for a new tech company. Being a student and club leader at Haas has given me significant access to companies I’m interested in networking with as well as space to focus on the skills I want to develop. In addition to treks, the Culinary Club organizes potlucks, food outings (taco truck tour, anyone? ), cooking classes (Rollin’ with my Homies, a lesson in Vietnamese Rolls), as well as “Haas Mystery Meets” that enable Haasies and other grad students to get to know each other better. The Net Impact Club connects students with a variety of socially responsible businesses through internship opportunities and treks, the Net Impact Conference, and a variety of events to meet alumni and students at other schools interested in social responsibility. My class is amazing – I always knew that! :) However, the November razor buzz and over $25K raised for charity showed that MBAs know how to make money… out of hair! 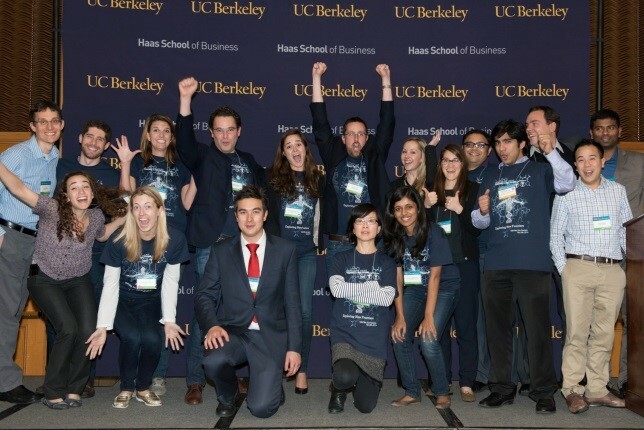 Every November Haas students commit to give up their razors for 30 days to support Challenge4Charity, a non-profit organization that unites MBA students from nine West Coast business schools to support local charities and develop socially responsible business leaders. Upon 30 days of struggling to explain employers the new not-so-business look, students auction their faces, heads, chests and other body parts to be shaved in a way the highest bidder wants and wear that hairstyle for next 24 hours…going to class, doing career treks and interviews.. This year my classmates went above and beyond, generating even more cash flows via bake sale and bold Facebook campaign! No Shave campaign of 2012 doubled previous year’s bid. Will November 2013 beat that? Thanks to the leadership of Investment Club co-President’s Chao Zhang ’13 and Matt Therian ’13, 16 Haas MBA students (plus 1 undergraduate) visited Los Angeles for two days last week and met with a range of investment management firms across both public and private investment classes. Courtney Walker, newly hired account manager for financial services and real estate, also joined us. On Thursday, we took a quick flight down to Burbank and met with Oaktree Capital, an alternative investment firm. Immediately, we got a sense of the firm’s culture summed up by Howard Marks, the firm’s founder who has a rule on hiring “no jerks.” We also heard from several investment professionals across the firm’s distressed debt, high yield, and private equity groups including Rajath Shourie, co-Portfolio Manager and Jerilyn Castillo McAniff, Senior Vice-President and a Haas undergraduate alum. Aaron Bendikson, Managing Director, encouraged us to think of business school as a “priceless call option” and to use our time wisely to reflect and explore different career options. Later that evening, we checked into our hotel and changed out of our dress clothes. Several of us stumbled upon a family-style Mediterranean restaurant, where we enjoyed a nice break, good meal, and a lot of bonding with our fellow classmates. On Friday, we got going early to meet with several more firms. First, we had a breakfast meeting with the Capital Group, one of the largest public equity managers. Three Capital investment professionals discussed their work and long-term, diversified investment approach. Portfolio Manager Greg Johnson described how he “skips to work every day” and highlighted the intellectual excitement of a career in investment management. We also got great advice on preparing for stock pitches, a necessary component of the investment management interview. We were advised to keep our stock pitches concise and not worry about making mistakes. Finally, the group finished by meeting with PIMCO in Newport Beach, where PIMCO account manager and recent alumni Laura Bentzien ’12, hosted us. Imagine our surprise when we entered PIMCO’s trading floor and saw the words “Welcome Haas Investment Club” on the stock ticker around the floor! Several of us also managed to catch Bill Gross, a legend of the investment industry. Despite being 68, Bill Gross is still one of the earliest in the office and still finds time to do yoga in the middle of the day. 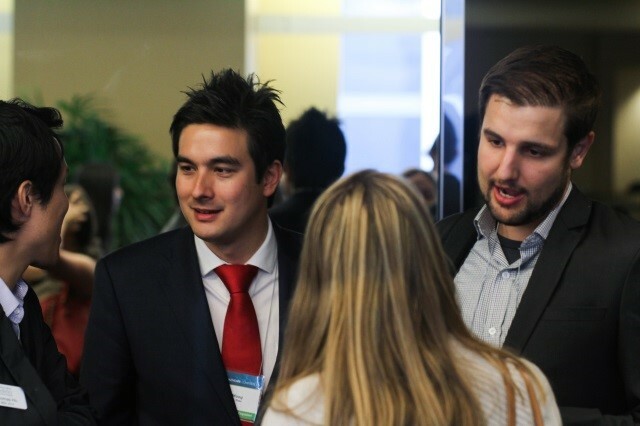 Finally, an informal networking reception with plenty of refreshment and delicious cookies capped off our LA visit. All in all, it was a great trip and we all benefited from our interactions with some extremely talented investment professionals. We returned to the Bay Area late Friday night, exhausted but pleased with our experience. I was honored to help organize this year’s annual Diversity Workshop on October 13th. We had a record turnout, with prospective students joining us from all over the world! At Haas, leadership is rooted in innovative thinking. Over 50 current students, alumni and staff volunteers from various ethnicities and backgrounds participated by demonstrating that our culture really does thrive on valuing the voices and opinion of those different from ourselves. Dean Rich Lyons kicked off the day by relaying Haas’ s commitment to diversity through strategic relationships with organizations like the Consortium for Graduate Study in Management and Management Leadership for Tomorrow (MLT). Haas Diversity Director Eric Abrams and distinguished keynote, Mike Smith (Berkeley-Haas Alum ’98) also spoke about the true benefits of receiving an MBA from a top program. Additionally, Professor Ming Leung facilitated a mock case study, which highlighted the importance of diverse perspectives in the business world. Attendees also had the chance to interact with current students and alumni, get application insights from the admissions committee and learn about the career search process, scholarships and financial aid opportunities. Along with the main event, there were pre and post activities on Friday and Saturday including a Consortium student panel discussion, lunch with current students, and happy hours in both San Francisco and Oakland. We were excited to see many prospective students from the MLT program in attendance. “It was a unique opportunity for me to learn about the culture at Haas. I can definitely say that I can see myself going here,” remarked one attendee who will be applying to the Haas via The Consortium. Myself (VP of Diversity for the full-time program) along with Olivia Herbert (VP of Diversity Evening and Weekend Program) and Matt Wadhwani (Haas Student Ambassador) were the student organizers. We spent weeks planning with the Haas admission team. Our goal was to ensure that prospective students walked away feeling as if they truly understand what life is like across each of the MBA programs. I’m proud of all of the positive feedback that we have received.